New to Quads - Advice? I'm new here -- hi all! About a month ago I purchased a WLToys V959 quadcopter -- it was cheap and I was looking for an excuse to get back into RC after a 20 year hiatus. It's small but flies great and runs 2.4Ghz. I'd like to upgrade, that is start small by purchasing a transmitter (hopefully one that I can bind to these little quads). I was looking an a Hobby King OrangeTX or a Spektrum 6 channel. Any advice? Also, can I build a decent quad for under $100? A turnigy 9x, not the 9xr, will bind to your quad just fine. I cannot answer the last part though! Hey skeplin, I'm new too. can I build a decent quad for under $100? I'd love to be proven wrong on this but I don't think it can be done. Depending on what equipment you already own, a couple lipo packs and a charger is going to be around $30. I was on a real tight budget when I built my first quadcopter last year and like yourself, I was also coming off a several year hiatus from the hobby. Because of this, I had to order just about everything (connectors, hardware, heat shrink, ect). After it was all said and done, my total was around $200. It's all of the little things that add up. If I were to set out and build the same quad again, now that I have all of the its and bits, I could probably get it close to $100. Thanks for the replies! I have an old Futaba 4 channel TX / RX that I used to fly my gliders with but it's circa 1989 which means it's wide band AM (40Mhz?) I read somewhere that those are no longer allowed by the FCC. I'm not worried about the cost so much as I am about getting the right gear. I don't want to spend a lot of money on something cheap now that isn't going to last me through quads, planes, or whatever I choose the fly with it. My Dad found a busted foamy in the trash complete with a Spektrum AR600 DSM 6 channel RX, a couple of servos, a 30A ESC, and a couple of Lipo packs. Great find! Would it make sense to get a Turnigy or stick with a Spektrum? Should I shell out the cash for a 6xdi or just save with a 5e? Oh and Liemavick -- thanks, I think I will. My Dad found a busted foamy in the trash complete with a Spektrum AR600 DSM 6 channel RX, a couple of servos, a 30A ESC, and a couple of Lipo packs. Great find! That's a nice find, wish I could get that lucky. Since I got back into this hobby, all of my builds have been done on very tight budget. Having previously used JR equipment in the past (JR Max 6 FTW!) 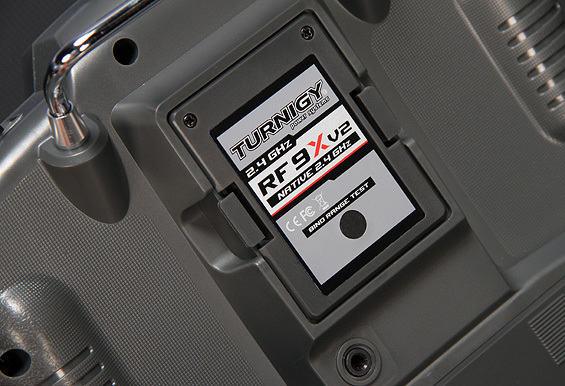 I was really hesitant about buying a Turnigy 9X, $60 for a 9ch computer Tx w/RX almost seemed too good to be true. Its made me a believer though, I've been using it daily for the past year without any issues. IMO, the best part about this transmitter is all of the modifications that can be done to it. Out of the box, it's a decent Tx, but when you reflash it with ER9X FW, wow, it's a totally different transmitter. Swap out the stock RF module for a FrSky ACCST system w/ telemetry ($50), add in a LiFe pack battery ($15), and you'll be hard pressed to find a better Tx system for under $500. I've never flown with Spektrum equipment, so I'm in no position to say one's better than the other, but until I can afford to purchase a JR 12X, which will likely be never, the 9X will continue to be my Tx of choice. Here's a picture of my 9X. As you can see, I have the blue backlight installed and I also made up a mount for my old Inspire 4G smartphone which I use for tuning my Tricopter's PID settings with. Thanks guys, I had no idea that you can mod the transmitters. Back when I used to fly the most we could do was adjust the springs on the sticks. Liemavick -- did you buy your TX from HobbyKing? That's a cheap price! IBeHoey, is your smartphone connected to the transmitter or is that telemetry coming from something else? Heh yeah, before I bought my 9X, I was doing some reading up on it and stumbled across a wiki page that had a whole list of different hacks and modifications that can be done to this Tx. I knew right then and there that this was the Tx for me. I know what your saying though, this hobby has changed so much in the past 20 years. It's crazy, and I love it! 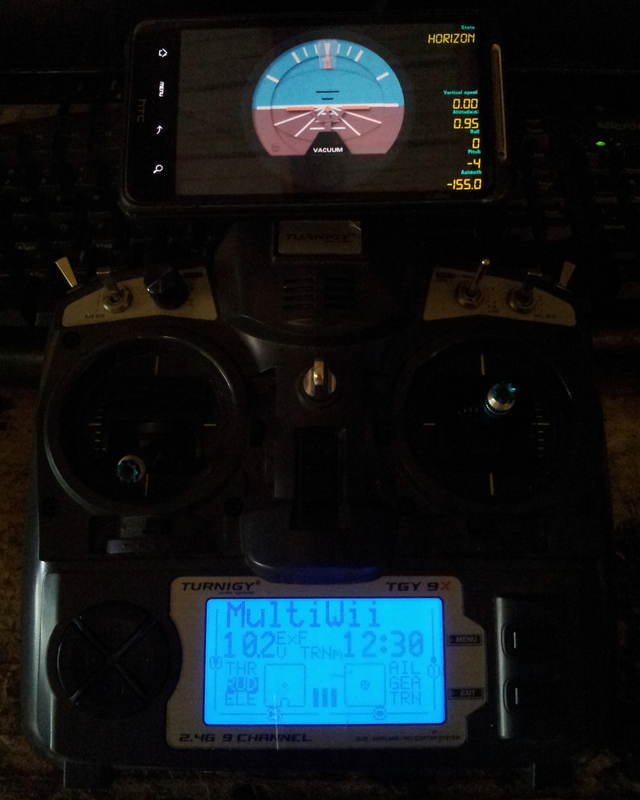 As for the smartphone in my pic, I have it linked to my tricopter via Bluetooth and I'm using the Multiwii EZ-GUI app for my phone. It works really well. Not having to lug a laptop around with me just to tweak PID settings in the field is awesome. Granted, it doesn't have great range though, I'd say about 10m/30ft tops. About 90% of the flying I do is in my backyard anyways so its lack of range isn't a huge issue. The HK Orange transmitter might be a nice middle ground. From all of the reviews it's a great little radio. It's just about a clone of the Spektrum DX6(i?). It's cheap, and you don't have to buy a module for it. It's also been reported to be much more user friendly in the programming side of things. Thanks FlyingMonkey. Can you explain what you mean by "buy a module"? The box in the center is the module. It seems they come equipped with them now. They're the code box that allows the transmitter to talk to the receiver you're using. A Futaba module won't work with a Spectrum receiver. Once upon a time you're get the "blank" transmitter, and you'd have to buy your own module separate. Ah gotcha. We used to have to drop a crystal into our radios. I think I may be sold on the Turnigy 9X. I've read that a battery pack is a plus but it seems difficult to determine which one is right. Any advice there?